I've seen this ramen shop (#01-41 Forum The Shopping Mall, 583 Orchard Road, tel : +65 6235 0855) around for a long time but for some reasons have never gotten interested enough to come by until today. Apparently, they were established from back in 1953 in Fukuoka. So the Hakata style influence is in the menu and the broth for their bowls are mostly tonkotsu. This one wasn't tonkotsu but a creamy chicken broth. What intrigued me into getting this bowl was that it came with lemons. The tori paitan wasn't very rich. It tasted unimpressive initially. After crushing the lemons into the bowl, the broth perked up from the citrus. The heat also mellowed the lemon slices that I ate them. This bowl turned out to be nice. I'd eat this again happily. Only 10 bowls a day though. That's the dry ramen with mentaiko. That mentaiko and dried seaweed combination is an unassailable umami bomb that results in almost surefire deliciousness. 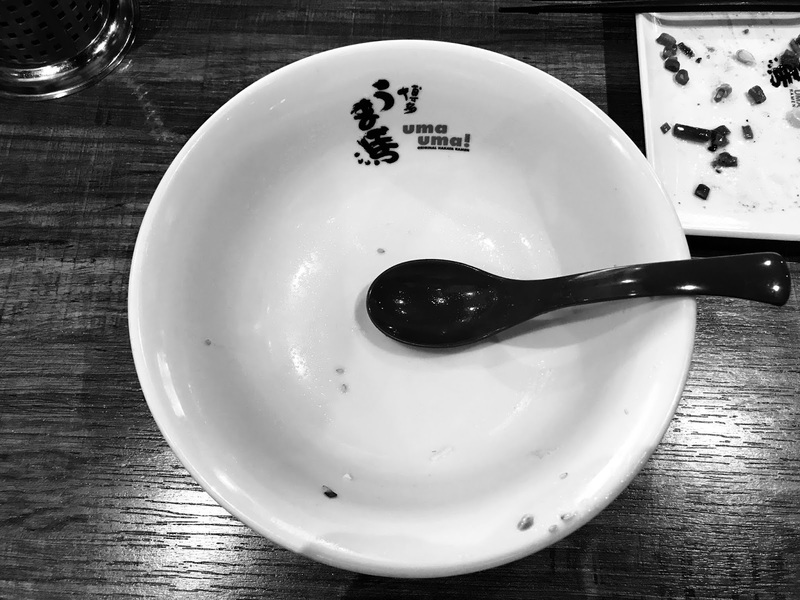 This bowl was like that. Savoury and yummy with those thin Hakata styled noodles. Didn't like their grilled beef. Overcooked and chewy. Menu mentioned truffle salt. Couldn't taste the truffle but the beef sure was salty though. I was hoping that there would be nothing but salt for flavouring but the meat was marinated. Very tangy salty chewy beef I guess I just didn't agree with. There's coffee jelly with vanilla ice cream for desserts. Think we started to like coffee jelly from the past year. This one felt like a Japanese-esque version of affogato. I remember thinking the same the last time we were here. About how time has streamed by quietly - almost stealthily. That was almost five and a half years back. Bread seemed to have changed. This one was good because of what we had ordered. But we first made short work of the first basket with butter. That's a half portioned salad with Roquefort and bacon. I was a little disappointed by how tiny the portions were and how the salad tasted as a whole. Bacon was dry and the greens were not nicely tossed. As Roquefort salads went, this was totally outgunned by the one at ABC Kitchen in Hong Hong. L'Angelus' tartare de boeuf was made table side where one could indicate the level of spiciness. What I didn't expect was that one of the condiments that went into it was ketchup. O-o The tartare was pretty good though. The spices that went into it tasted balance compared to say, the feistier ones from Le Bistrot du Sommelier or La Cabane in Hong Kong. The fries that came with the tartare were soft, suitably salted and delicious. That in the copper pot was their fricassee of roasted half spring chicken in a truffle and morel cream sauce. Chicken was nice. Potatoes were sweet. The rich velvety sauce which was awesome infused with the mushroom flavours was awesome. We mopped the pot clean of it. Wished the chicken was bigger though. One the left, brandy marinated Griotte cherries with a nutty pistachio ice cream. Loads of cherries with the cream and more at the bottom of the cup. On the right is strawberries and vanilla ice cream. Coffee was drinkable - not outstanding. Bitter and lacking in body. This was from the pizza section at Picnic. Yes, that's the Picnic at Wisma (#03-15, 435 Orchard Road). The one where Omakase Burger is currently located. We were pretty impressed by the effort the person at the counter put in for the distribution of the ingredients. The chap that was on the dinner shift on 13th April. Nice! We noticed that a number of the ingredients they were using were a notch better quality than most. This one had fresh mozzarella, blue cheese, mushrooms and pepperoni. Each of that nicely portioned topping came through. Pretty good eating with the crisp thin crust. Oxwell & Co. has Sunday roasts so....well, we're here. One of the brunchy alcoholic beverages they have is their Bloody Bill. Their take on the Bloody Mary using the Botanist gin and balsamic vinegar according to the menu. Don't know where that balsamic vinegar went. Having tasted and bought a bottle of Botanist not to long ago, I can say that there's not enough of it to register. Jerusalem artichoke soup was so so. Nothing to get excited over and something I wouldn't bother with again. Thought it was a Sunday roast, we had a pie. Albeit one that looked like a large char siew sou (叉燒酥). T'was actually pretty good. The stuffings were sweet potato, mushrooms and chestnut. Pastry was crisp and buttery. Came with a forgettable creamy mustard sauce. I recommend their Yorkshire pudding sauce with it. That, was delicious. Their crispy skinned seabass option looked a little sad on the portions. It's just two small pieces of fish. They were firm and flaky with crispy skin but it was too little. I ordered this because I like Brussels sprouts. I like them even more with smoky bacon and maple butter. That maple butter also works well with their Yorkshire pudding.